Methylation is a biochemical process that is involved in nearly all of the body's functions, including detoxification, energy production, genetic expression/DNA repair, neurotransmitter balance, and immunity, among others. The methylenetetrahydrofolate reductase, or MTHFR for (very) short, gene contains the DNA code to produce the MTHFR enzyme. 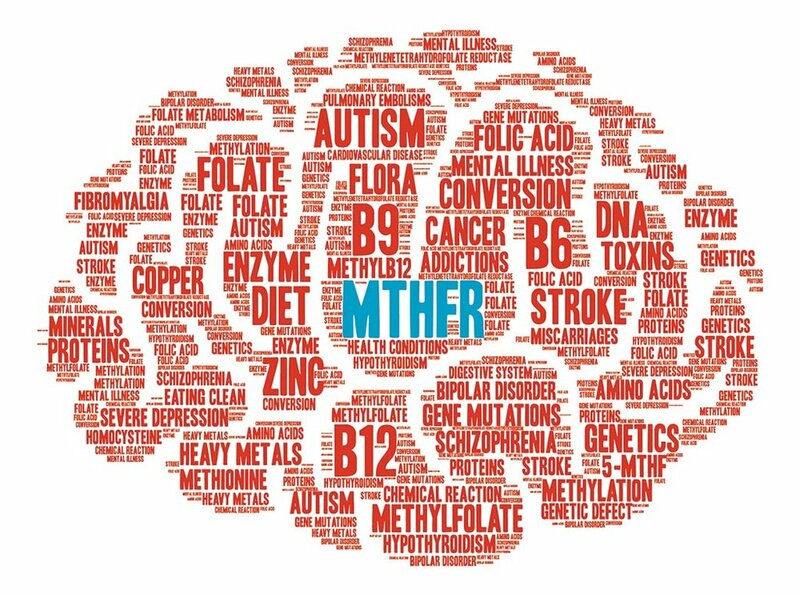 The MTHFR enzyme acts to add a methyl group to certain nutrients such as Folate (B9) and B12, a necessary process that allows the body to properly use those nutrients. It also plays an important role in Glutathione production. Methylation issues can lead to chronic fatigue, foggy head, mood problems, heart disease, weakened immune systems, or any chronic illness that aren’t easily diagnosed. WONDER WHY YOU NEVER FEEL WELL? If you have one or more MTHFR mutations and your ability to methylate is reduced, your body won’t be able to convert as much of it, and you will typically have high levels of homocysteine in your blood (elevated homocysteine levels typically indicates undermethylation; however, low homocysteine levels can indicate either over or under methylation). MTHFR mutations, which cause these high homocysteine levels, negatively impact mental health and mood, and have been linked to an increased risk for cardiovascular disease, high blood pressure, blood clots (thrombosis), certain types of cancer, high inflammation and free radical levels, and neurological problems. MTHFR has also been found to increase the risk of miscarriage and birth defects, including Spina Bifida, and autoimmune diseases. Lifestyle modifications can reduce the frequency of cellular replication, and therefore, slow the aging process. Our therapies help slow the loss of telomere length, and help your body slow aging, prevent age-related diseases, and improve your overall health and well-being. Getting in front of these issues today will only improve your life in the future. Since Folate, B12, and Glutathione are vital micronutrients, it is important to know if your DNA contains a mutation in your MTHFR enzyme. This knowledge will allow you to properly supplement these important nutrients. Add a Micronutrient test to find your nutritional deficits, and the Food Sensitivity test to find inflammatory trigger foods, to help slow and even reverse your telomere aging. Some people believe having two mutations (homozygous) may lead to more serious problems. There are two variants (forms) of mutations that can occur on the MTHFR gene. C677T. Some 30 to 40 percent of the American population may have a mutation at gene position C677T. Some 25 percent of people of Hispanic descent, and 10 to 15 percent of Caucasian descent are homozygous (have two mutations) for this variant. A1298C. Around 20 percent of the American population may have a homozygous mutation at gene position A1298C.